KUALA LUMPUR (Oct 23): The FBM KLCI has staged a technicl rebound today climbing above the 1,800-point psychological level in tandem with the upward trend among the Asean markets. At 5pm, the benchmark index went up 14.46 points or 0.8% to close at 1,810.68 points, led by gains on heavyweights, such as Genting Bhd, Felda Global Ventures Holdings Bhd and KLCC stapled securities. In the broad market, some 1.6 billion shares, worth RM2.01 billion were traded. 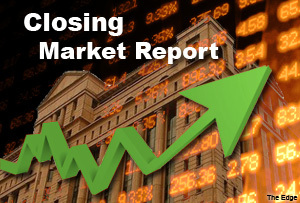 Market gainers trounced decliners by 670 versus 185, while 249 counters were unchanged. Jupiter Securities’ Chief Market Strategist Benny Lee told TheEdge Markets.com that the KLCI was catching up on a technical rebound although the major bourses like Hong Kong and Tokyo were lower today. Reuters reported that Asian shares sagged on Thursday after a retreat on Wall Street and falling crude oil prices rekindled investor anxiety over slowing global growth, while a mixed picture on Chinese manufacturing failed to impress markets. Japan’s Nikkei 225 was down 0.37%, while South Korea’s Kospi fell 0.27%.The Shanghai Composite Index also fell 1.04%. Hong Kong’s Hang Seng dropped 0.3%. However, markets in Asean were mostly higher today. Singapore’s Straits Times Index gained 1.05%, Jakarta Composite Index was up 0.58% to 5,103.52 points, while Thai SET Index increased 0.43% to 1,532.72 points. Lee opines the KLCI’s higher closing today may be ‘temporary’ as he believes the index may retest the 1,800 point support level, unless the ringgit strengthens against the US dollar. In contrast, Kenanga Research in a note today said should the index strengthened above 1,800 points, it would likely retest the 1,820 point resistance in the near term. The research house added the local marke would take its cue from the upcoming US economic data and earnings reports. The top gainer was Danainfra Nasional Bhd while the leading decliner was Dutch Lady Milk Industries Bhd. The most active counter was Malaysian Airline System Bhd. The national carrier’s share price closed at 25.5 sen with 78.52 million shares traded.